The LA Tourist | Grand Park in Downtown L.A.
Grand Park in downtown L.A. spans the distance between City Hall and the Music Center. The park offers several points of interest, places to relax, a coffee shop and L.A.’s famous gourmet lunch trucks on Wednesday and Thursday afternoons. Grand Park is where you can get great pictures of City Hall, in the afternoon sunshine, or watch a lighted fountain show at night. 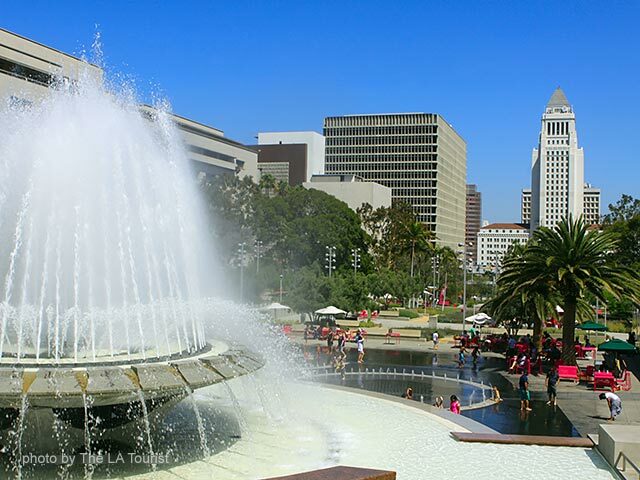 To get there, take the Red Line train to the Civic Center Grand Park Metro station in downtown Los Angeles.